Mark Wahlberg and Rose Byrne bring home a trio of kids in a syrupy, manic adoption comedy that'll have you doubting the parenting skills of all involved. Sensible moviegoers averse to schmaltz and unnecessary crudity know to avoid the Daddy's Home movies. That said, writer-director Sean Anders and co-scripter John Morris score a little stronger with their latest comedy about an unconventional family—no doubt since it’s based on Anders’s own personal experiences with adoption. 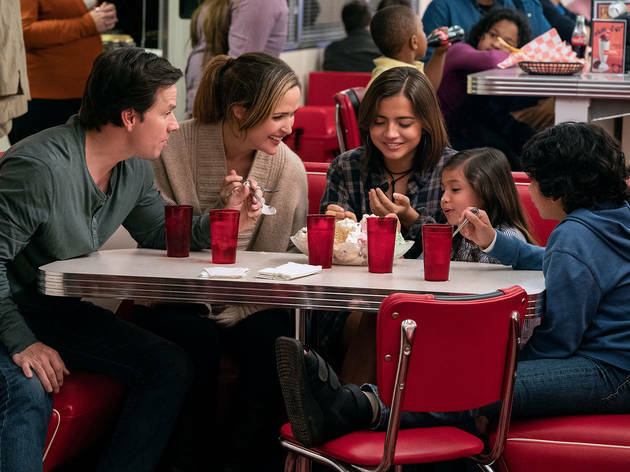 There’s genuine heart and feeling scattered throughout Instant Family, enough to make one wish it would stick to a consistent tone without being repeatedly undercut with forced gags. Mark Wahlberg (from the Daddy’s films) and Rose Byrne play Pete and Ellie, who make their living renovating houses and have started feeling the emptiness of their own nest. They decide to go the foster-parent route, and after attending classes full of would-be adopters, end up bringing home a trio of siblings. The kids all have the standard issues: Lizzy (Isabella Moner) is a rebellious teen, younger Juan (Gustavo Quiroz) is a bundle of hypersensitive nerves and little Lita (Julianna Gamiz) is a brat. Pete and Ellie’s attitudes toward them keep changing from scene to scene, depending on the effect Anders is after. And if you can imagine the most predictable development to bring third-act conflict to this particular story, you’d probably be right on the money. 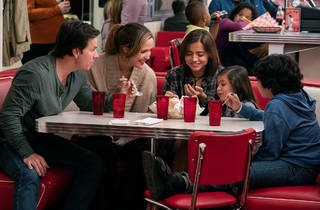 Still, if Instant Family manages to land more emotional and amusing moments than it deserves to, that’s thanks in large part to two of the performances. Rising young star Moner is terrific as Lizzy, bringing credibility and empathy to a role with even more mood swings than your average teenage girl. In the smaller part of cool grandma Sandy, Margo Martindale tears through the movie like a comedic force of nature, stealing her every scene. They’re good enough to make one wish for an alternative version that’s more about Lizzy and Sandy bonding, and less about Pete and Ellie flailing through contrived situations and lowest-common-denominator laughs. I really loved this film, it was uplifting, funny and heartwarming, it made me laugh and cry! Lizzy played a brilliant part as the eldest of the adopted children and I'll always watch a film with Mark Wahlberg in. The one thing that disappointed me, was the portrayal of the 'single mother' who wanted to adopt a child, she came off pretty badly in this which I think was a shame. That aside, I really enjoyed it and would recommend!